It is a repeat of Last Year. Well it has started all over again another year. It started out ok in a way because we went to St. George to help Dad set up a new computer and we had fun doing that. It was a nice visit and we also were able to see Dawny and Jeff although not near long enough. Dad's Computer set up but after we arrived home some time later he had to get another one as this one had gotten sick. Dad did a good job of setting it up the second time and I hope it is working ok for him now. When we got back home from St. George the next day Lorilee calls me at work and says the basement is flooding. So when I got home from work I started pumping out the water trying to find where it was coming from. I just couldn't believe it was from the water heater because we had replaced it last year about this time. Well after much bailing and watching I discovered it was indeed the water heater. I spent Tuesday finding another water heater and getting it installed. We were lucky it was still under Warranty and we got this one for nothing except a few minor fittings we had to buy. We are now back up and running with hot water again and the basement is staying dry for now. It has snowed here some this month and it has been white on the ground most of the time. I even had to use my four wheel drive on my truck a couple of times and it sure helped. I hope the year will start being better now. Not much else I can think of right now but will try to add some thing else when I think of it. Have fun everyone. I know it has been a long time since I posted anything on my blog but my life is kinda of boring I think. I am getting ready to leave tomorrow for Provo as Lorilee is to get a new pacemaker. We will spend the night in a Motel so we can get to the hospital by 6:00 am. She will have to stay overnight on Monday night then we can come home the next day. I had a nice time about a month ago when we took Nadine for a ride over Nebo loop to look at all the fall colors. Since I last blogged we have got our roof on the house replaced and we have new vehicles now. These are nice to have now. We got rid of the old cars and worked on the yard and been doing other boring stuff like that. Work has been going along steady and I am approaching my retirement which is great I can see the light at the end of the tunnel only less than a year and a half. The balcony was redone also on the house and I have all the stuff to build a new railing around it but that will have to wait till spring. We everyone has a happy Thanksgiving and wish you all the best. I guess I had better write something on my blog since I haven't in a while. I think I don't have anything worth writing about so maybe this will bore you all. We have all been bitten by the Farm Town bug and I have been busy working my farm and it seems like all the family is doing it. It seems to be very addictive. I can hardly wait to look each day and see what is ready for harvest and what I can give as a farm gift to others. It is all quite fun. This last few days have been spent helping my wife and daughter get better from their flu fortunatly it wasn't the swine flu but they were still very sick and I stayed home a couple of days to help them out. They are both doing better now. I went back to work today and it was a long day. At least it is nice to have a job right now. Our temple district is due to go online with the new Family Search so I got registered to use it. I hope it will clear up alot of double work that has been done for the same people. I tried to get the lawn mowed for the first time this year but am still working on it as the tending of my sick ones took up alot of time. I still have half the back yard to do yet. I have yet to turn in the water for the lawn yet. I have a lot to do and my aching back doesn't help any. I have to quit every so often to rest the back. It seems like the weather is bad when the weekend comes around and that hasn't helped any either. I hope we can get things ready and maybe take the trailer for a little camp trip this summer. I miss the hills and camping among the pines and trees. Cabin fever I guess. Lorilee and I have plaved some Wii bowling and boy she can bowl on the game anyway. I have only won once when we have gone head to head. Well I am going to sign off for now and say Good Night! 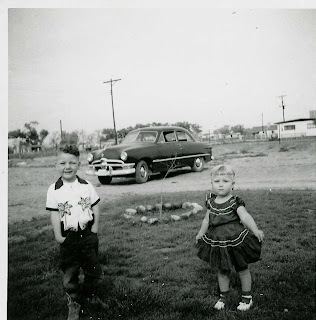 This My sister and I in South Phoenix in the 1950's. 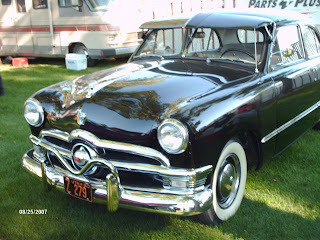 This is a car at the car show last year and it looks quite close to the old one we rode in as kids. The one we rode in was blue though. I thought it was interesting. I thought this was an interesting clip showed on TV. Listen and Watch for the picture and mention of his name. What is with this Tag Stuff? I don't quite know how this is supposed to work but I sure think it feels like homework. I don't do homework any more except to do honeydos. Incidently I had to do those yesterday and today. Our dryer went out the bearing was louder than anything else running. So we got a new one delivered to the house yesterday and I put it in and got it working. We also did some cleaning on the back porch and kitchen kind of early spring cleaning. Now on to this tag thing. 1. I like to work on the computer google and internet stuff. 2. I like coming home from work. Does that count? 3. I like doing family history on my computer and have been trying to organize it so it all makes sense. I am a family history consultant at the Gunnison Family History Center on Thursday nights. 4. I also enjoy camping and I don't get to do that enough. Last summer when gas prices were so high we went to a family reunion on my wife's side and camped there for several days as it was only 30 miles away. After that we got us a little outdoor fireplace and spent several evenings just out in the back yard cooking hobo dinners or roasting hot dogs and Marshmellows things like that. We prefer to go up into the mountains and camp among the pine trees near water if possible. 5. I like listening to music watching videos of music mostly country and oldies. I like the doo whoop and 50's, 60's, 70's, 80's. I also mix my own cd's and play them. It takes me back to the good ole days and I just like the country songs don't know why. 6. I like watching movies. We have a pretty good size dvd collection and enjoy watching them. I like the action movies and westerns and comedys. I have the collection of James Bond movies and Clint Eastwood Movies and of course all the star wars and star trek I can get. Animated movies are fun also. The girls like the horror and mystery movies. Hope this is good. I am through now and am going to do some other things now.